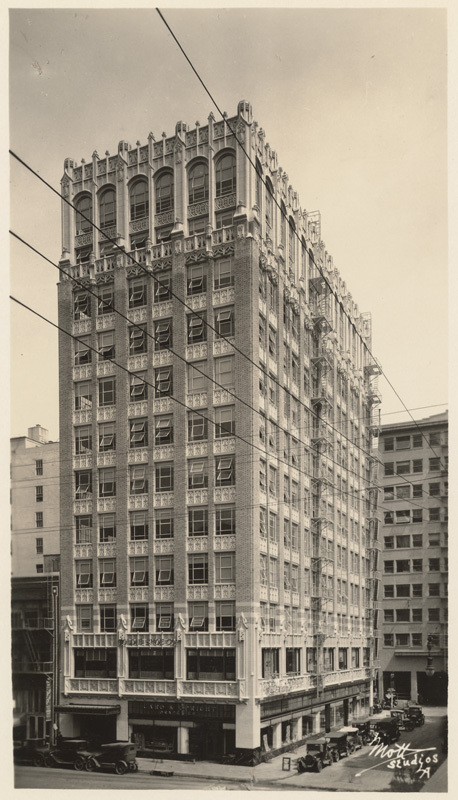 Los Angeles had been a garment manufacturing center since the early 20th century. It experienced rapid growth in the 1920s, largely due to the increasing popularity of sports knitwear and department store demand for ready-to wear lines. The Garment Capital Building at 217 E. 8th St. at Santee, designed by William Douglas Lee for developer Florence Casler in 1926. CSL. But, while noted as a sportswear capital, Los Angeles lagged far behind Paris and New York as far as the world of couture was concerned. With Europe at war however and cut off from Paris, by fashion editors had to devote more attention to American designers. Local designers hoped the West Coast might have a greater influence on fashion overall. 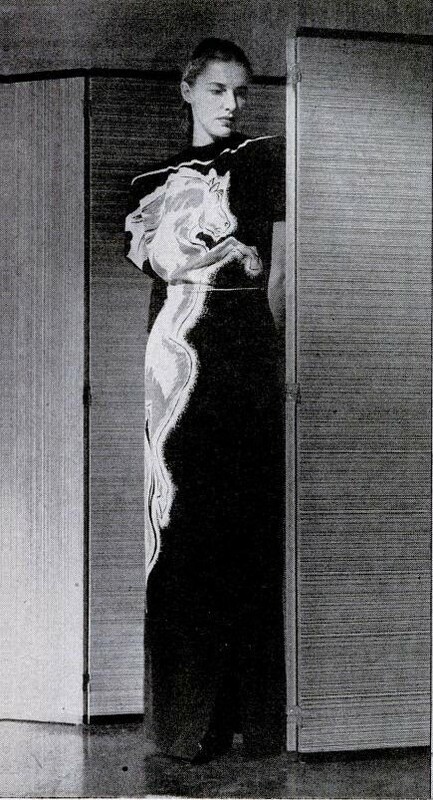 The Broadway department store, promoting California designers’ “California Fashion Futures” show at the Ambassador Hotel, February 1941. Highlighted are fashions by Barney Max, Margit Felligi and Mabs Barnes. 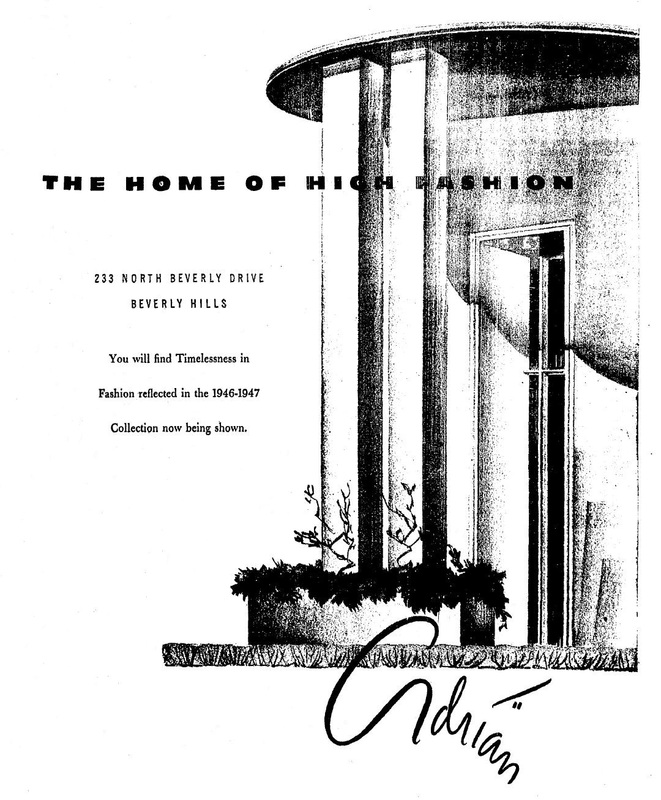 “The Home of High Fashion.” September 1946 ad for Adrian’s fall 1946-1947 collection featuring a sketch of his salon at 233 N. Beverly Dr., which he opened in 1942. The building previously housed Victor Hugo French restaurant. Southern California’s own Nancy “Slim” Hawks was named Best Dressed Woman of 1946. Frequently seen in the pages of Harper’s Bazaar during the war years, she saw New York model Betty Bacall on the cover of the same magazine in 1943 and brought her to the attention of her director husband, Howard Hawks. Renamed Lauren, Betty appeared opposite Humphrey Bogart in Hawks’ To Have and Have Not in 1944 and The Big Sleep in 1946. Hawks based Bacall’s costumes in both films on his wife’s own wardrobe. Pictured here in an equine-themed Adrian creation, “Slim” said she ran around in dungarees most of the time and didn’t own a Paris gown. From Life 1-20-1947. 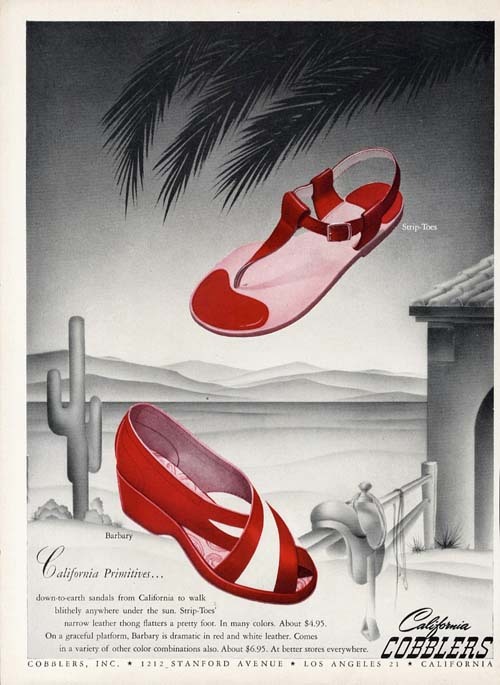 During the war years, leading fashion magazines like Vogue and Harper’s Bazaar, which had previously barely recognized the existence of California before, did often feature Adrian and other California designers. With the war’s end, local designers were keen to retain their fashion influence. A new magazine, The Californian, showcasing California designers and the California way of life, began publication in 1946. 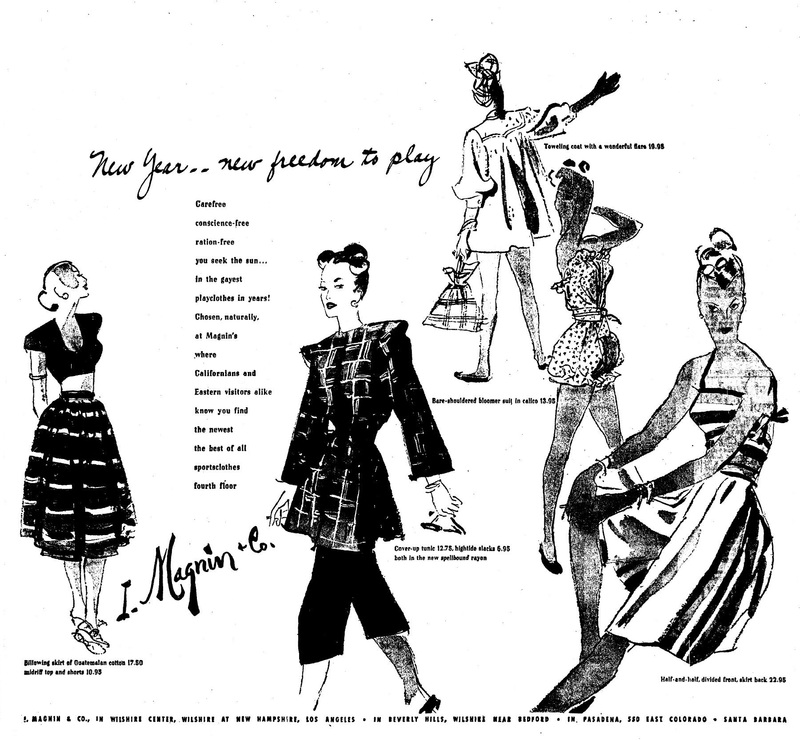 “New Year, new freedom to play.” High-end retailer I Magnin celebrates the end of rationing with a number of casual-wear trends for 1946: swing coats and balloon sleeves; plaids, stripes, and South America influence; broad shoulders and peplum waists; bloomer suits; cropped slacks; bare midriffs and bare shouldered looks. January 1946. 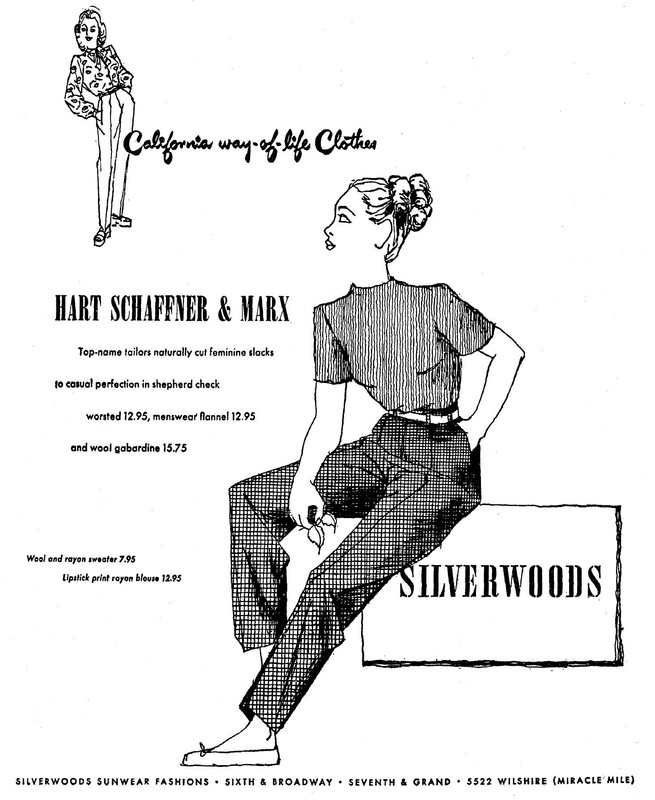 Silverwood’s, retailer of the Hart Schaffner & Marx line, had trouble keeping men’s suits in stock due to a shortage of mid-priced suiting fabric highlights, but there were no issues with women’s clothing. 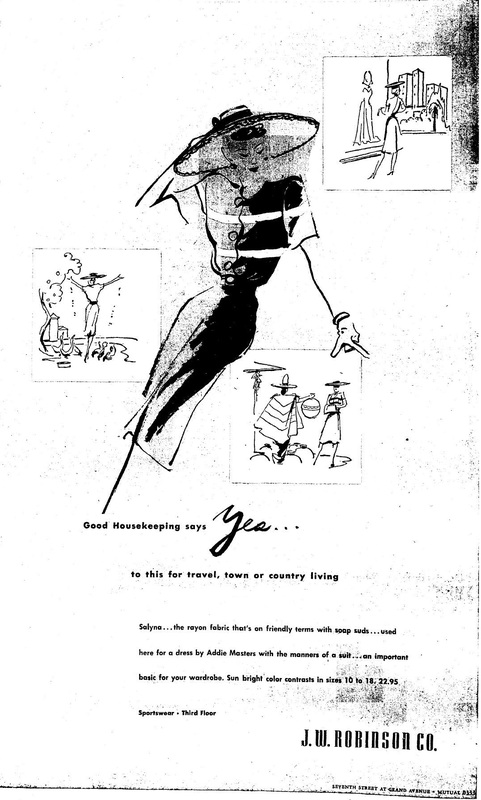 Here they highlight “California way of life” clothing like shepherd-check cropped slacks, ballet flats, and a lipstick-print rayon blouse. April 1946. For whatever reason, Southern California had a higher concentration of fashion designers than the northern half of the state. Los Angeles Times fashion editor Fay Hammond attributed it to the area’s unique geography and climate. “California’s style creators, living, working, playing in a romantic land of fabulous contrast have developed a whole new fashion philosophy. Here, where snow-crested mountain ranges look down upon a panorama of ocean beaches, palm trees, orange groves, deserts flowering with exotic blooms and year-round sunshine, they design colorful, functional clothes that reflect the beauty of their surroundings. Unhampered by the traditions of their craft, their styles are refreshingly young, original- patterned after a unique way of life,” she wrote in January 1946. That fall, in September, Los Angeles played host to California’s first ever National Fashion Press Week organized by the California Apparel Creators. Chairman Fred Cole of Cole of California swimwear sponsored a special train, “Westward to the Sea,” to bring 150 top fashion editors and experts to the city for three days of fashion extravaganzas showcasing cruise and resort wear, Southern California style. 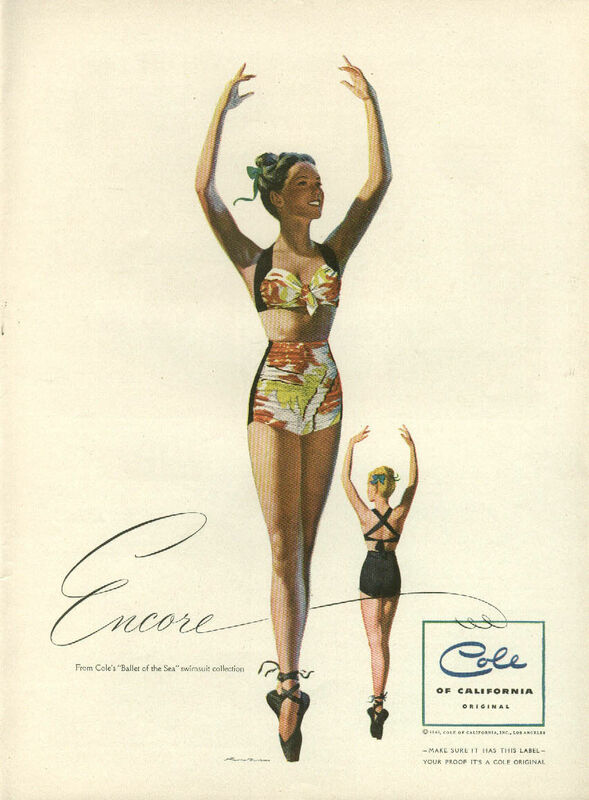 Cole of California’s “Ballet of the Sea” line in a national advertisement, 1946. 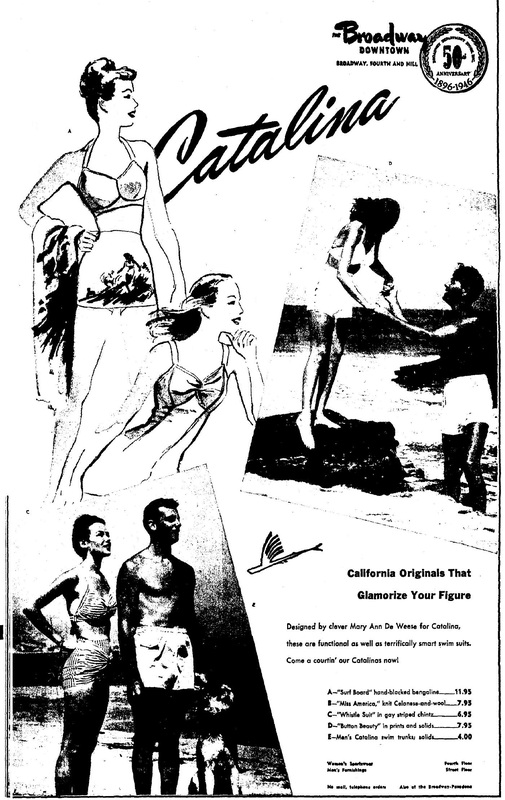 Cole of California swimsuits available at Coulter’s department store, February 1946. Popular young designer De De Johnson kicked things off with a show staged on the patio around the pool of her Brentwood home. Johnson was credited with originating “pedal pushers” and was also known for her charming novelty prints. 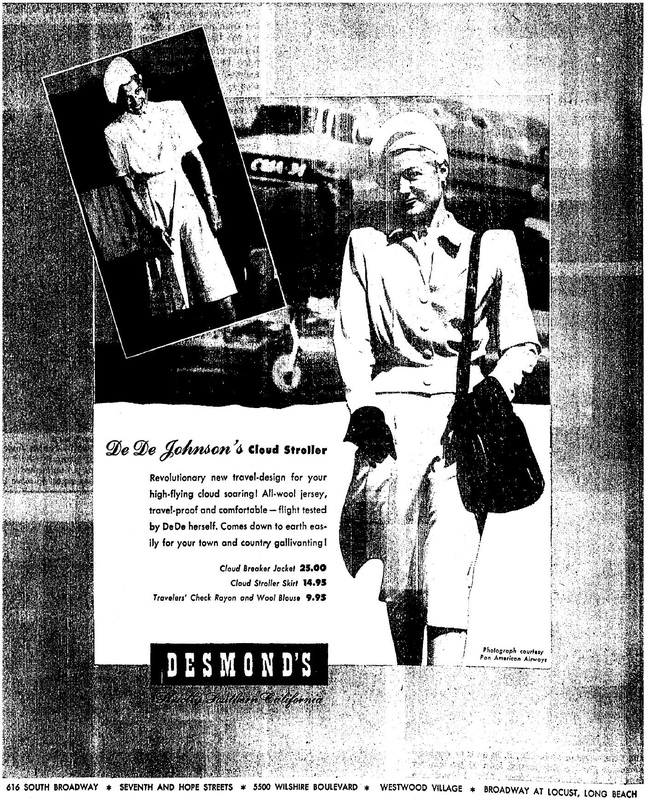 De De Johnson’s monogrammed pedal pushers, worn here with another popular trend of 1946, known to ladies’ fashion as the “battle jacket.” It was modeled after the military’s “Eisenhower jacket.” The Californian, February 1946. 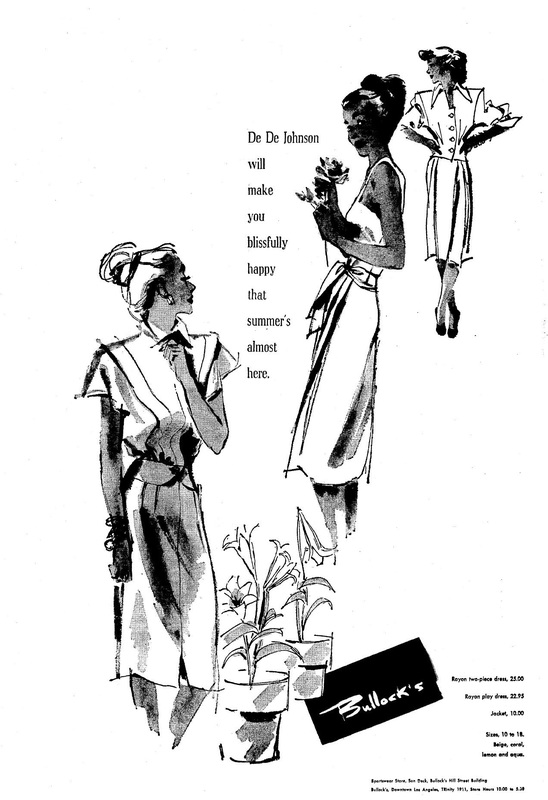 De De Johnson’s summer designs for 1946 at Bullock’s, April 1946. She often used white to highlight one’s tan. 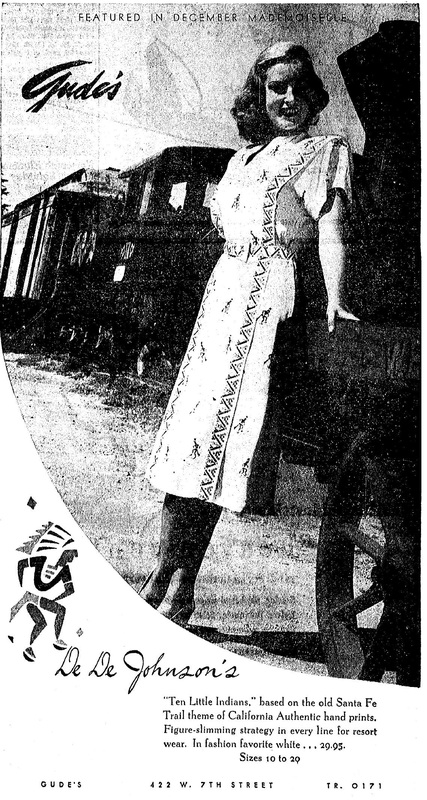 De De Johnson’s Native American-themed print dress, featured in the December 1946 Mademoiselle magazine, retailed locally at Gude’s, 422 W. 7th Street. De De Johnson herself modeling her “cloud stroller” wool jersey travel suit, designed specifically with airplane travel in mind. 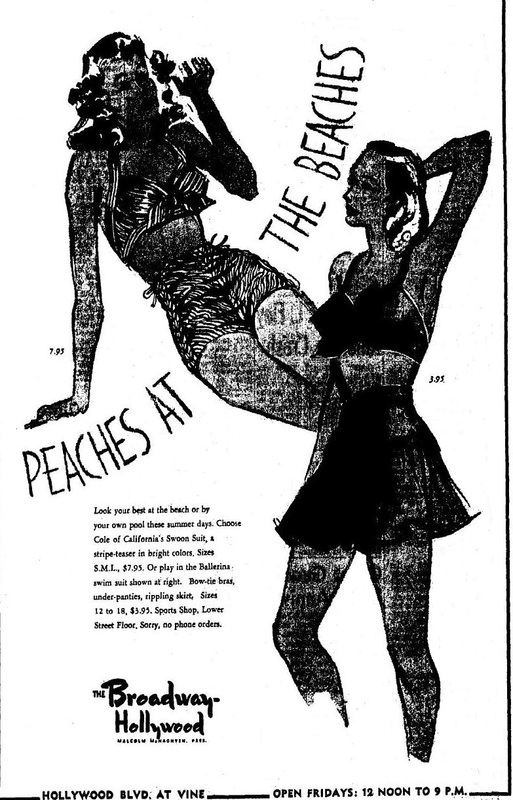 Available at Desmond’s (“Strictly Southern California”) in August 1946. On September 18, Margit Fellegi, Mary Ann De Wesse, and Lynn Lester staged a nighttime show around an illuminated pool to showcase their swim, cabana, and sportswear collections. 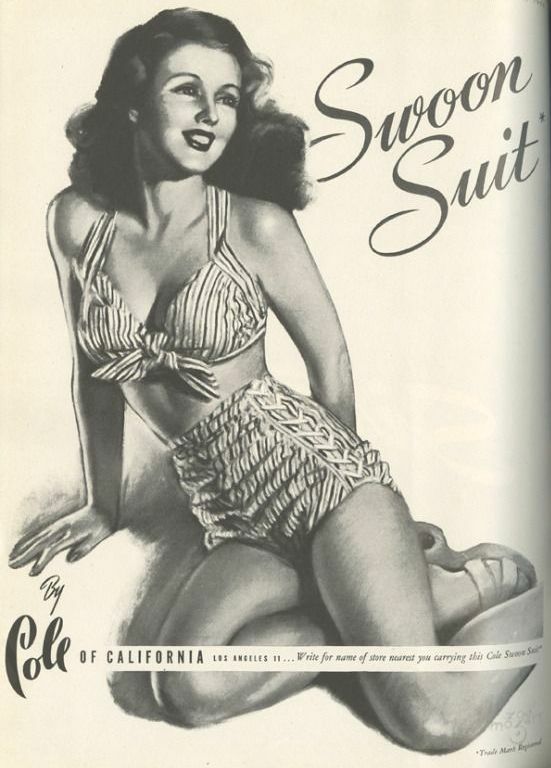 Margit Fellegi designed swimwear for Cole of California, most notably the still-popular “Swoon Suit” in 1944. Margit Fellegi’s Swoon Suit for Cole of California, “a striptease in bright colors,” which retailed at The Broadway Hollywood for $7.95 in August 1944. Mary Ann De Weese designed for Catalina swimwear. 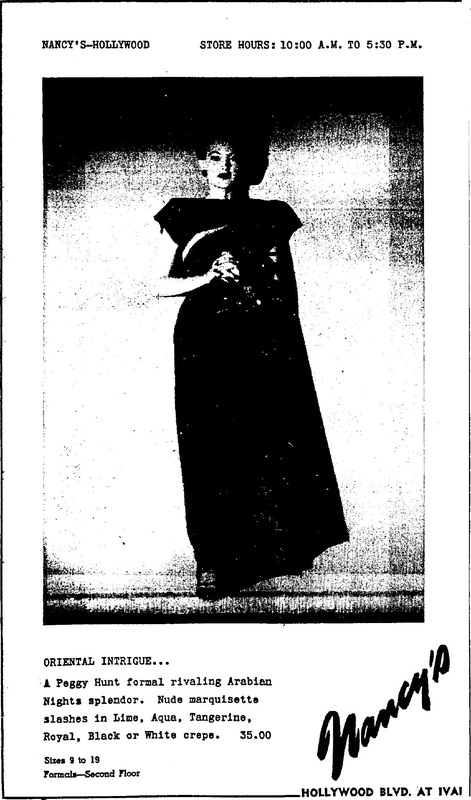 Ad for her designs at The Broadway in March 1946. 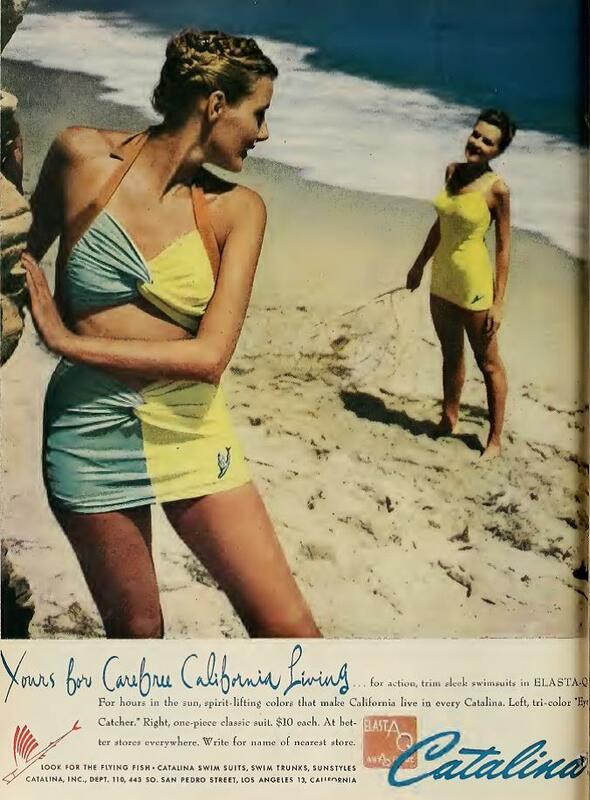 “Yours for carefree California living…For hours in the sun, spirit-lifting colors that make California live in every Catalina” The tri-color “Eye-Catcher” and yellow 1-piece. The Californian February 1946. Chalk stripe suit “in the famed Lynn Lester manner,” if not an actual Lynn Lester design, retailed at the Brooks chain in November 1946. The fashion press attended an aquacade-style at the Huntington Hotel in Pasadena. Another night they were among the 400 guests to attend a dinner and fashion show in the garden of designer Peggy Hunter. Eight designers exhibited 72 styles, highlights from their collections: Addie Masters, Luella Ballerino, Irene Bury, Viola Dimmitt, Marjorie Montgomery, Agnes Barrett, Mabs Barnes, and Peggy Hunt herself. 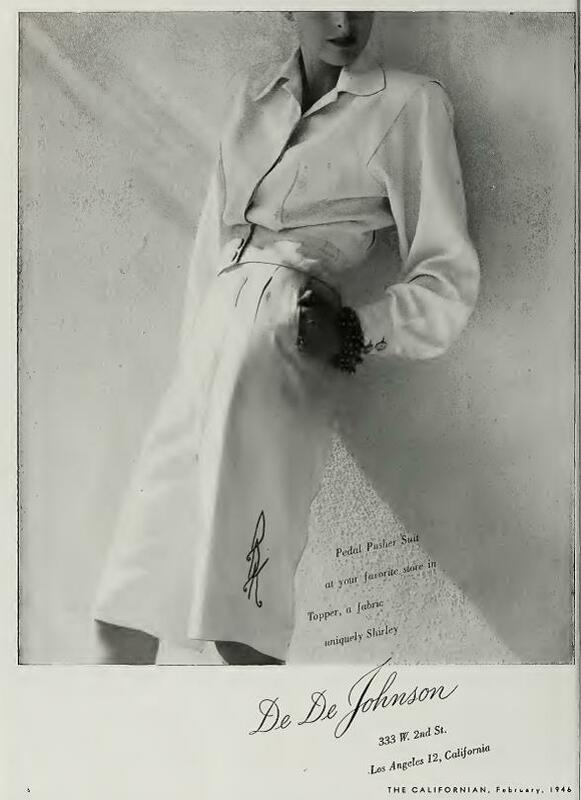 Addie Masters, noted for her “patio togs” and lounging costumes, exhibited hostess pajamas in white crepe with applique tulips. Once an aspiring actor, she attended design school while working as a film extra. 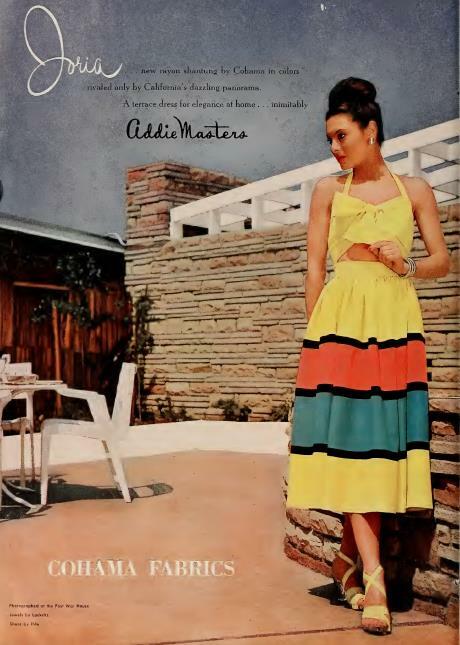 Addie Masters got the Good Housekeeping seal of approval in 1946. 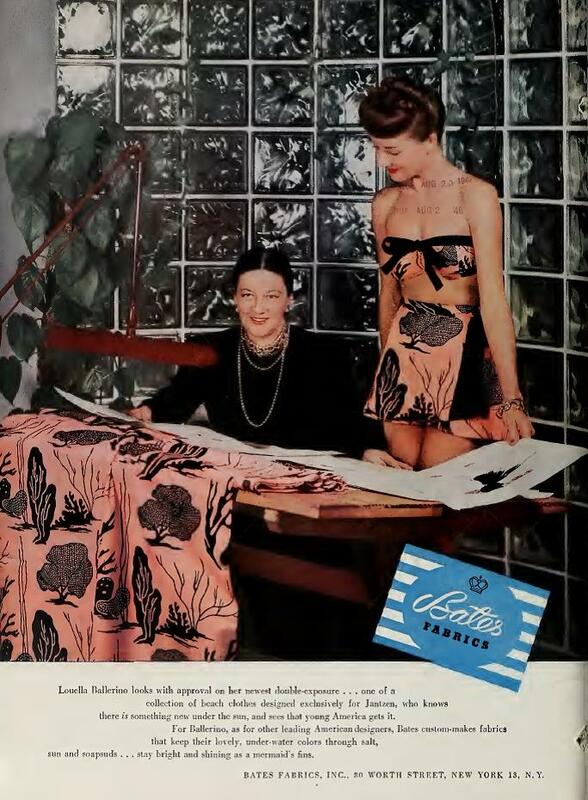 She, along with several other California designers, was featured in Good Housekeeping’s July 1946 issue. This dress retailed for $22.95 at Robinson’s department store. Addie Masters’ vibrant, midriff-baring patio dress. The setting looks like the Postwar House on Wilshire Boulevard. The Californian, July 1946. 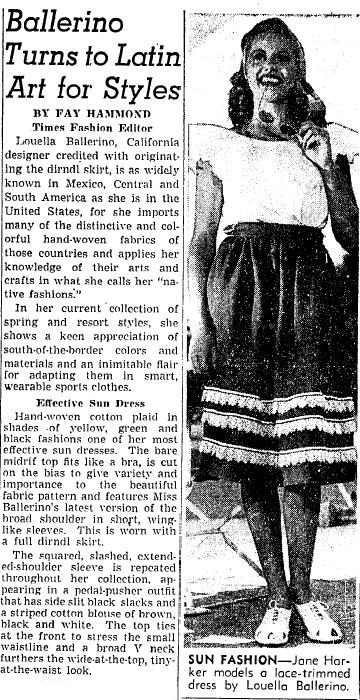 Louella Ballerino was noted for her “California Native Fashions,” influenced by the state’s Mexican heritage. She was also credited with originating the dirndl skirt/peasant blouse trend which was everywhere in 1944 and remained a popular casual look for the rest of the decade. 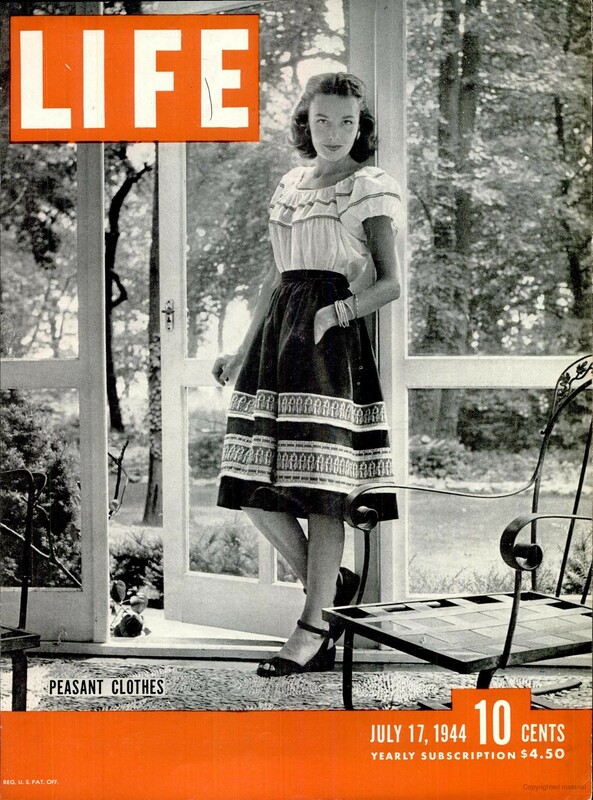 “Peasant Clothes” highlighted in Life, June 16, 1944. Kay Hammond writing of Louella Ballerino’s Latin-influenced designs, summer of 1946. Jane Harker models the eternally-popular peasant look. 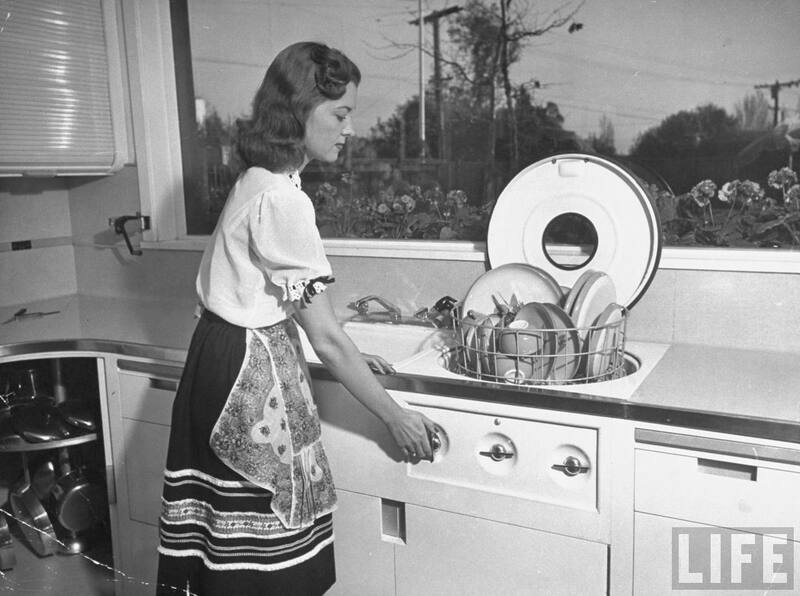 A peasant look to promote the Fritz-Burns postwar house kitchen, March 1946. 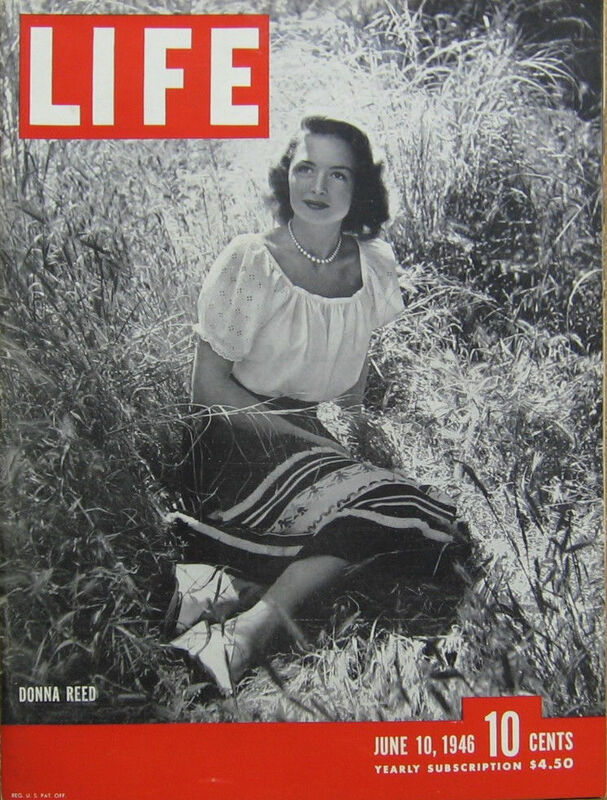 Donna Reed in the Ballerino peasant look in Life, June 10, 1946. Louella Ballerino pictured in an ad for Bates Fabrics. The Californian 1946. 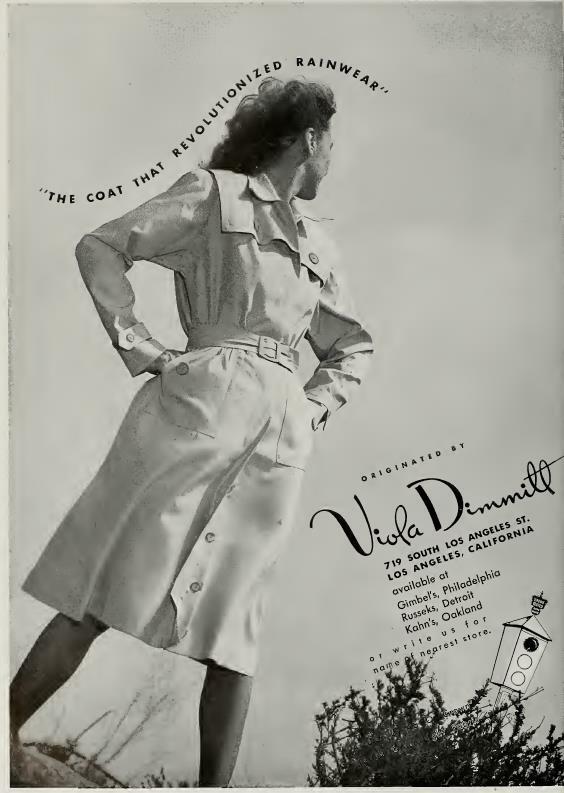 Viola Dimmitt was known for her raincoat designs, though it never rained in Southern California. The Californian, August 1946. 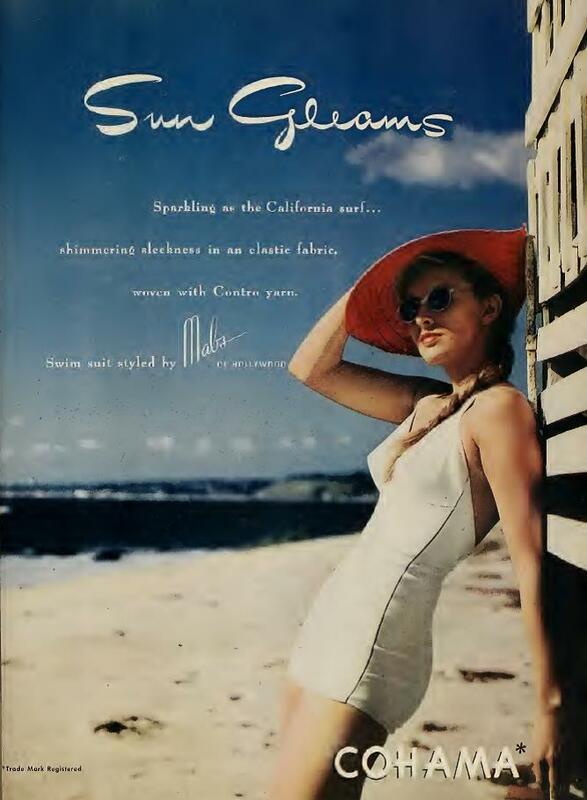 “Sparkling as the California Surf…” A Mabs Barnes design for Mabs of Hollywood swimwear. The Californian, February 1946. A Peggy Hunt original available at Nancy’s on Hollywood Boulevard & Ivar (the former I. Magnin Building) in June 1946. 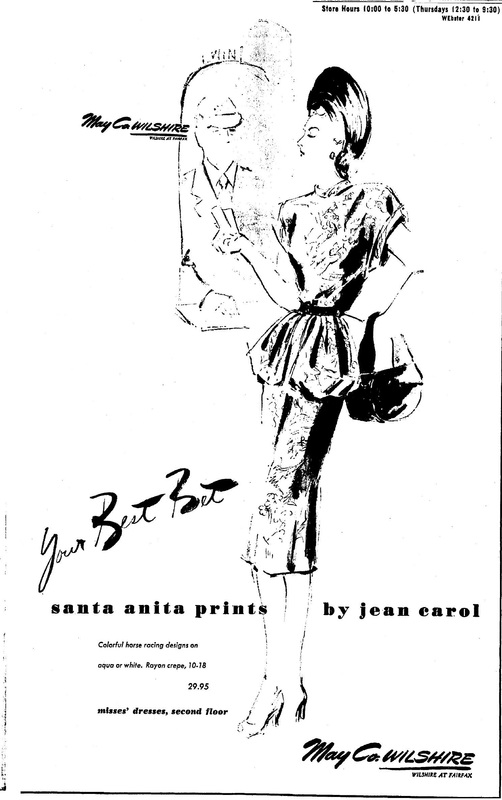 Peggy Hunt was also behind the Jean Carol label, here showcasing a dress with a Santa Anita horseracing print by Hess-Goldmith. 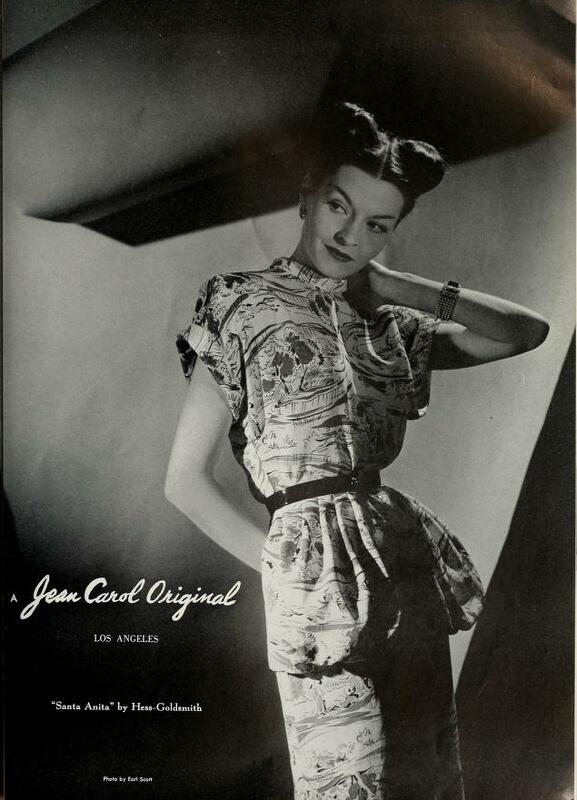 Jean Carol’s “Santa Anita” novelty print dress available at the May Company, June 1946. On September 20th, Lou Van Roy exhibited sportswear, including her popular slack suits and playsuits, at a garden luncheon in Beverly Hills, but Pat Premo had to cancel her planned dinner show at the Hotel Bel-Air due to a strike. Instead, she had an impromptu showing of sundresses, playsuits and summer casuals at her newly-decorated showrooms. Designer Lou Van Roy was affiliated with Joseph Zukin, garment manufacturer who came to Los Angeles from New York in 1916. 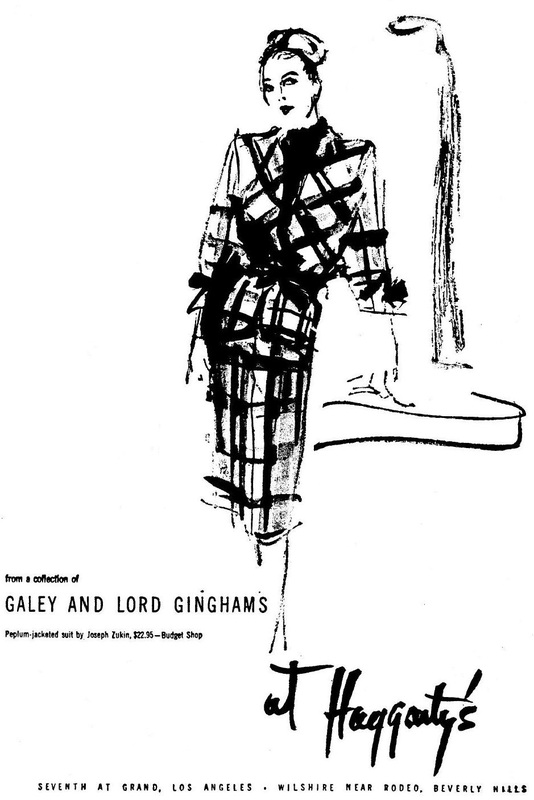 A Zukin plaid peplum-jacket suit retailed at Haggerty’s in April 1946 for $22.95. 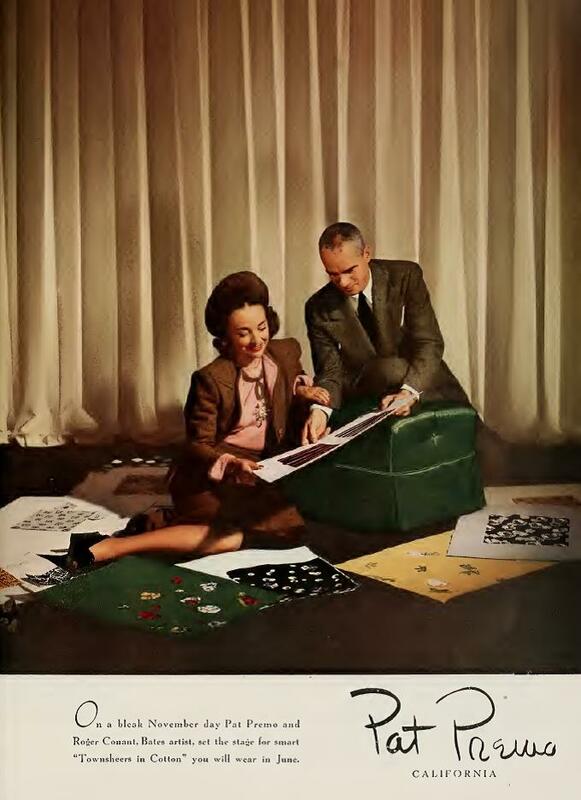 Pat Premo pictured in an ad for Bates Fabrics. The Californian, March 1946. 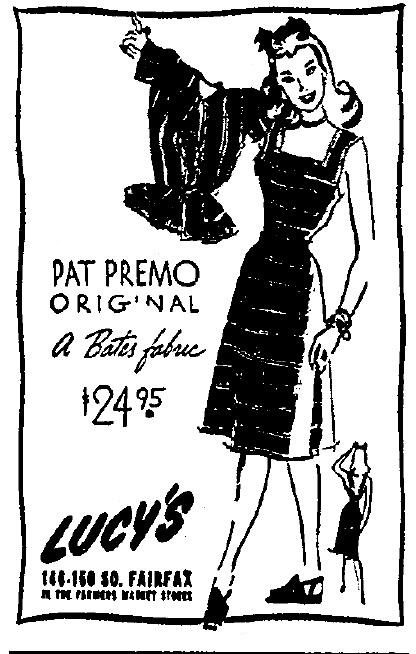 Pat Premo Original at Lucy’s dress shop in the Farmer’s Market shops, July 1946. In addition to wearing apparel, Los Angeles also had designers and manufacturers of accessories- glove-makers, cobblers, milliners. 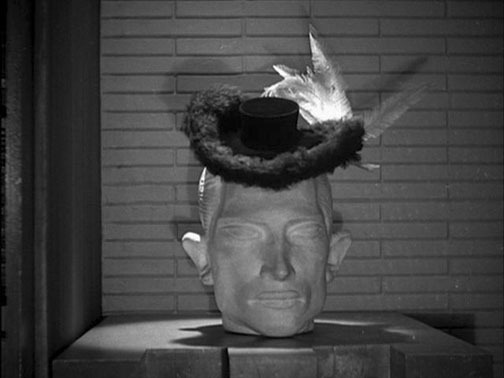 Keneth Hopkins (spelled with one “n”), a leading local design of custom millinery, created the all-important hat for Howard Hawks’ Phantom Lady in 1944. It was a departure from the pumpkin-like hat of the novel. 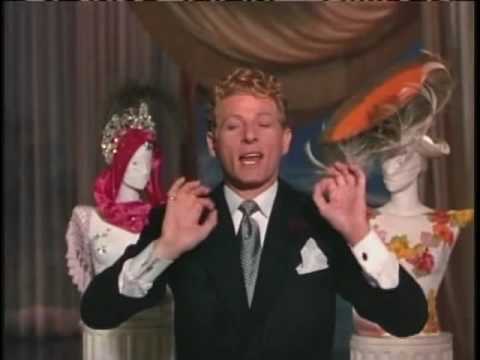 Keneth Hopkins hats in The Secret Life of Walter Mitty with Danny Kaye (1946). 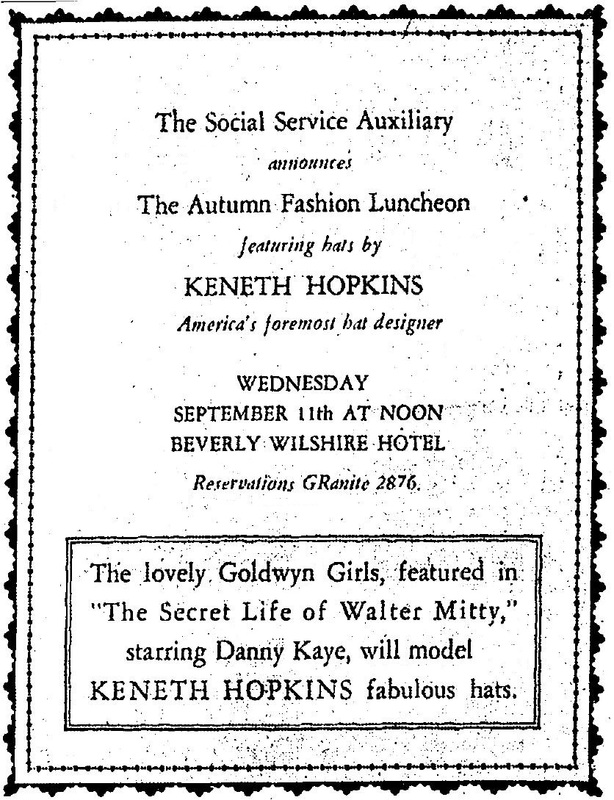 Goldwyn Girls from The Secret Life of Walter Mitty modeled Keneth Hopkins hats for a charity luncheon at the Beverly Wilshire Hotel in September 1946. 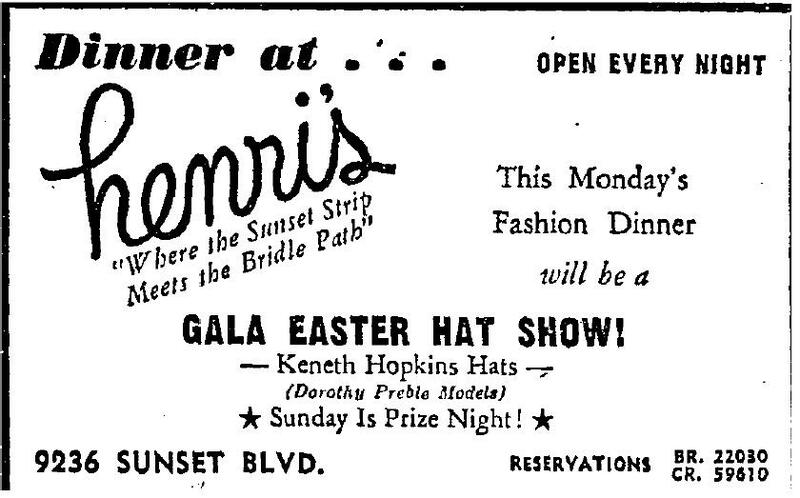 Keneth Hopkins Easter hat show at Henri’s, 9236 Sunset Boulevard, 1947. 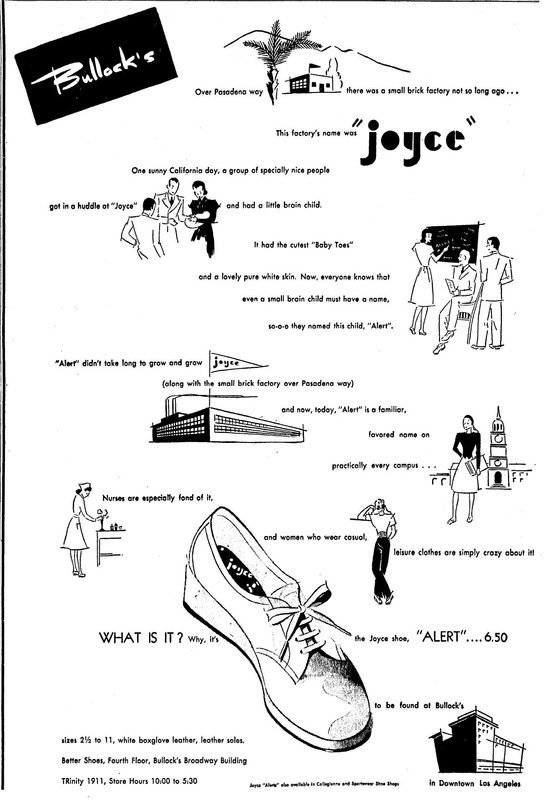 Pasadena-based Joyce shoes, which specialized in play shoes and casual styles, was founded in 1929 by William Henry Joyce. Wife Faie Joyce was a designer. They retailed at Bullock’s and other department stores. But while Los Angeles continued to grow a sportswear center in the postwar years, Paris soon resumed its place at the top of the high fashion pecking order. French designers even cut into the bathing suit market in 1946 with naval-baring numbers, Louis Réard called his the bikini after the U.S. nuclear tests at Bikini Atoll. 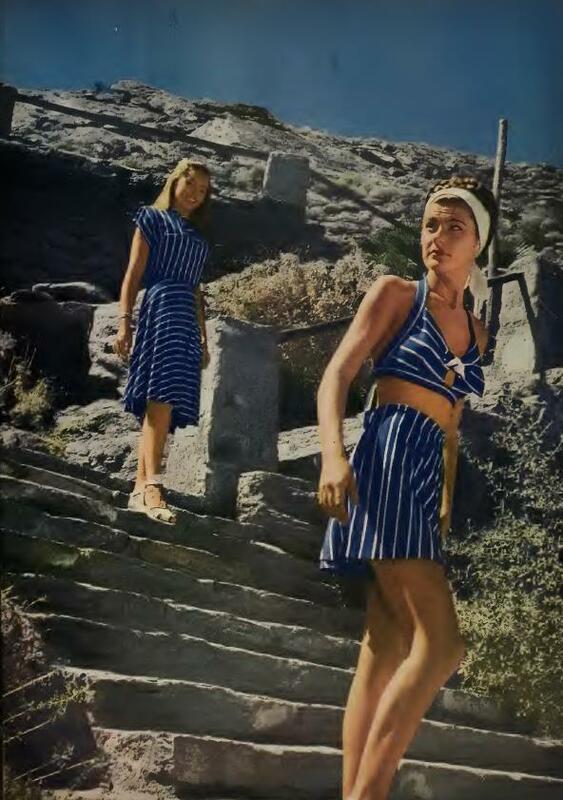 A naval-baring swimsuit might fly in the French Riviera in 1946 but took a while to catch on elsewhere. 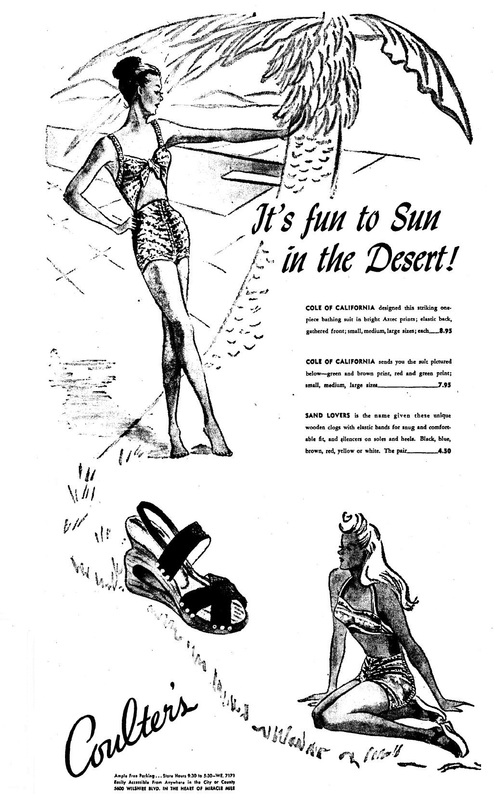 Louis Réard would call his version the bikini, though the U.S. press typically referred to it initially as the “French bathing suit.” Life, October 21, 1946.